When Israeli soldiers expelled Abir Hijeh, her five children and their neighbors from homes in a Gaza war zone, she said they warned her in broken Arabic: Go south or you might get shot. The group went the wrong way and came under fire from Israeli soldiers. 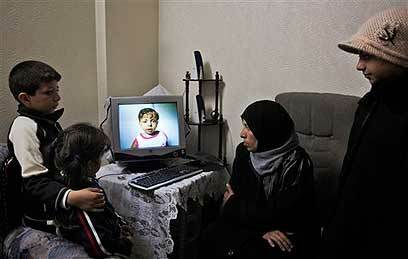 Hijeh was wounded and her two-year-old daughter was killed. Hijeh's account of a sniper firing on civilians, along with soldiers' graffiti and destruction seen by The Associated Press in homes they commandeered, lend support to allegations of Israeli army misconduct during the onslaught in Gaza. In recent testimony, Israeli soldiers told of vandalizing homes they seized to use as army posts, as well as relaxed rules of engagement, including hasty shooting at civilians. The soldiers, who spoke to a military prep school in a closed-door session, described an incident with similarities to the shooting of the Hijeh family. The accounts, published in two Israeli newspapers last week, further fueled international outrage over the Gaza offensive. Israel, which invaded Gaza to end years of rocket attacks by Hamas militants on Israeli towns, is already under international scrutiny about whether it used disproportionate force and failed to protect civilians. Gaza's Hamas rulers have been criticized for targeting civilian areas and using Palestinians as human shields. Senior military officials have acknowledged using massive firepower in Gaza to deter Hamas gunmen and prevent casualties among Israeli forces. The offensive was unprecedented in its deadliness, and contrasted with the smaller, pinpoint operations of the past in Gaza. However, an Israeli army spokeswoman, Maj. Avital Leibovich, said the military "took every measure of prevention possible in order to save the lives of Palestinian civilians," including phone calls and leaflets warning residents to evacuate. Some of the incidents described by soldiers are under investigation. The army chief, Lt. Gen. Gabi Ashkenazi, said this week that, if true, they were an aberration, not the norm. In the most explosive testimony, a soldier, identified only as Ram, said a sniper in his area killed a Palestinian woman and her two children after they misunderstood orders and walked in the wrong direction, entering a no-go zone. Another soldier, Aviv, described a sniper killing an elderly woman as she walked in the street, though his account was based on hearsay. Both soldiers were from the Givati Brigade, which during the war was deployed in the Zeitoun neighborhood of Gaza City. They were not identified to protect their privacy. Mohammed Ghannam, a field researcher for the Palestinian Center for Human Rights, said a review of his files found two possible matches, involving the Hijeh and Ayyad families, who were neighbors in Zeitoun. The families' accounts were similar to those of the soldiers, though there were some discrepancies and no independent corroboration. Both shootings took place near Israeli sniper positions set up in commandeered homes, with holes broken into walls for aiming rifles. In his testimony at the military school, Ram described a family who was confined to a room after troops took over their home and then was ordered to leave. "The platoon commander released the family and told them to turn right. A mother and two children didn't understand and turned left," he said. A nearby sniper had not been informed and opened fire, killing them, because he was under orders not to let anyone pass a certain line, Ram said, according to a transcript of the testimony obtained by the AP. Abir Hijeh told an AP reporter investigating the Israeli soldiers' accounts that her house came under heavy fire before dawn on Jan. 5, the third day of the Israeli ground offensive, and that her husband, Mohammed, 37, was killed by tank fire. Moments later, Israeli troops entered the home and ordered Hijeh and her five children, ages 2 to 15, to go next door, where about three dozen people were confined to one room. About noon, soldiers speaking in broken Arabic told everyone except the young men to leave and head to the southern town of Rafah. "They said, `Go to Rafah. If you go to Gaza City, you'll be shot, if you go to Rafah, you won't,'" she said. However, when they reached a T-junction, the eldest in the group decided to swing left, toward Gaza City, to check on his brother, who lived about 20 yards up the road, before turning toward Rafah. Everyone, including Hijeh and her children, followed. Retracing the family's steps with an AP reporter this week, Hijeh, 33, said they had walked just a few yards in the direction of Gaza City when soldiers fired warning shots at their feet. "They told us `Go to Rafah' and we raised our hands, all of us, the children and elderly," she said. "We turned our backs to head to Rafah and then the Israeli army began shooting heavily." Most in the group ran into a courtyard for cover, but Hijeh was carrying her 2-year-old daughter, Shahed, and could not keep up. She was struck by a bullet and the toddler was also hit. Hijeh said the shots were fired from a commandeered house belonging to the Abu Zor family 50 yards away. She made it to the courtyard, where she said she saw her neighbor, Ola Arafat, on the ground. Hospital officials said the woman died several days later. Hijeh said her daughter was still alive, so the group started walking, eventually finding taxis to take them south. The little girl was dead by the time they reached a hospital, she said. Another Zeitoun resident, Nafez Hijeh, 67, said he and another group of civilians approached the Abu Zor house earlier in the day and were halted by four warning shots from an adjacent army position. They eventually were allowed to pass unharmed, he said. During a visit to the house this week, an AP reporter saw a sniper's hole still visible in a corner wall, in a direct line toward the spot where the survivors said they had come under fire. Written in neat Hebrew script on the wall were operational instructions, such as "no shooting toward the east," but residents said soldiers chiseled away most of it before leaving. The second alleged killing, described by the soldier identified as Aviv, involved an elderly woman seen walking in the street. He said he was told that the company commander ordered troops onto the roof, along with snipers, "to take her down." The soldiers said they had been warned to be wary of potential suicide bombers and that anyone approaching their posts could pose a danger. However, some soldiers said they rarely came under fire from Hamas gunmen. Ghannam and another researcher, Mohamad Abu Rahma of the Al Haq group, said they believe the woman was Mahdiyeh Ayyad, who was in her 70s. After Israeli forces withdrew, the woman's body was found on a dirt road, near what had been an army position, her relatives said. She had been shot, according to Ghannam, but relatives acknowledged no one witnessed the shooting. The soldiers also described vandalism in Palestinian homes. Aviv said that before leaving, "we simply threw everything out of the window." 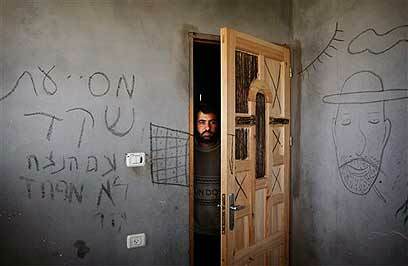 Several homes visited by the AP this week still had graffiti in Hebrew scribbled on the walls. "Death to the Arabs," read one inscription in a house near where Mahdiyeh Ayyad's body was found. "The eternal people have no fear," read another. "Long live the Jewish people," was scrawled elsewhere, alongside Stars of David and four-letter English words describing Hamas and Gaza. Crude holes for snipers were covered with plastic sheeting or stuffed with cloth. At the Daloul family's apartment in Zeitoun, empty tuna and peanut cans, a pair of army boots, Dorito wrappers and other trash littered the floors. Clothes were strewn about, a large closet had been overturned and furniture was destroyed. "Rovait Tzabar, with our heart and soul," read graffiti scribbled on the wall, identifying a unit in the army's Givati Brigade. A commander of a reserve unit in Zeitoun, who would only identify himself as Maj. Idan, told the AP he ordered his soldiers not to deface property and reprimanded anyone who did. He said he made the soldiers clean up before leaving and left behind army rations for the family to use. The allegations of misconduct come amid growing calls for a U.N. war crimes investigation of both Israel and Hamas. International and Palestinian human rights groups have collected evidence of possible violations of the laws of war in Gaza, including a Human Rights Watch report Wednesday accusing Israel of using white phosphorous shells indiscriminately in populated areas. Reuven Pedatzur, an Israeli military analyst, said he believes civilians casualties are inevitable when an army fights in densely populated civilian areas. He said some of the criticism leveled against Israel is hypocritical. "The Americans are doing it in Iraq and Afghanistan," he said. "They kill a lot of civilians. But when it comes to Israel, they say it's a war crime." See all talkbacks "Interviews back IDF misconduct in Gaza"